Homegrown e-commerce major Flipkart is in talks to raise $1.5 billion (Rs 10,000 crore) from Chinese Internet giant Tencent and US-based online selling platform eBay, a report in a financial daily stated citing three people aware of the development. 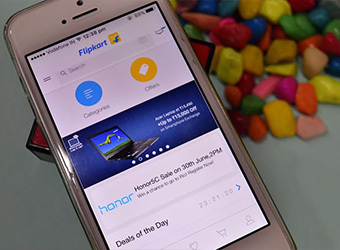 The transaction may see Flipkart merge or acquire eBay's India arm, The Economic Times report mentioned citing one of the persons familiar with the development. The American online e-commerce major could also invest up to $500 million, accounting for the lion's share of the investment and a potential third investor could also participate in the round, the report added. Last month, it was reported that besides Tencent and eBay, Microsoft Corp, PayPal Holdings Inc and Google parent Alphabet's investment arm Google Capital were looking to invest up to $1.5 billion (around Rs 10,040 crore) in Flipkart at a valuation of $10-12 billion. The latest deal would value the e-commerce company at $10-$12 billion, which would be a down round for the company that had a valuation of $15 billion after its last funding round in 2014, the ET report stated citing two people in the know. The funds would give Flipkart a fillip in its fight against US-based Amazon and Chinese e-commerce major Alibaba in capturing market share in the Indian e-commerce segment. "As a company policy, we do not comment on market speculations," a Flipkart spokesperson said in response to an email query from VCCircle. Flipkart's last raised $700 million in October 2014 from UK-based investment management firm Baillie Gifford, US-based VC fund Greenoaks Capital, Steadview Capital, T Rowe Price Associates, and Qatar Investment Authority. The round also saw participation from existing investors DST Global, GIC, Iconiq Capital, and Tiger Global. What could the new deal mean for Tencent and eBay? For eBay, it could mean a revival of sagging fortunes for its Indian arm, which has ceded a once dominant and profitable status to the likes of Flipkart, Amazon, Snapdeal and Shopclues over the years. eBay forayed into India in 2004. In 2014, eBay led a $134 million funding round into Snapdeal, obtaining a significant minority stake in the e-commerce firm. Subsequently, it pared down its stake in a $500 million funding round that Snapdeal raised from Foxconn and Alibaba among others in 2015. Currently, eBay's stake at the troubled e-commerce major is down to a low single digit percentage. Until March 2016, eBay held a 6% stake in Snapdeal, according to the ET report. Likewise, Tencent's India presence is marked by Naspers-controlled MIH Group, where it holds stakes in ibibo (now merged with MakeMyTrip) and other arms of the combined business entity. In 2012, Tencent introduced WeChat, the most widely used instant messaging app in China, through ibibo gaming, the online gaming venture of their joint operations. However, the move did not really take off as the Indian market took to other instant messaging apps that include Whatsapp, currently the most used application in India and Airtel scion Kavin Bharti Mittal's Hike. Incidentally, Tencent led a $175 million funding round in Hike, along with Foxconn in August 2016.